Do you experience itchiness or peeling with the dishwashing liquid you are currently using? Is your skin sensitive to the chemicals coming from the soap you’re using when washing the dishes? Worry no more and say bye-bye to skin irritation. You can maintain those soft hands even if there are piles of dishes to clean. You will even manage the dishwashing tasks even if there is a big party at home! Many households are now using natural cleaning products, particularly the homemade dishwashing liquid for all their cleaning purposes. However, there are still a lot of homemakers who ask why there is a need to use something homemade at all. Well, it’s already given that the majority of the commercial dishwashing soaps available in the market today are filled with toxins. Oftentimes too, the so-called ‘green’ cleaners offered contain chemicals. Therefore, it is still best that you make your own dishwashing liquid to guarantee a chemical-free cleaning product. An online article says that a dishwashing liquid that is claimed to be natural contains two F-rated ingredients that are considered non-chemical. These ingredients are the cocamide dea and sodium borate. And, though the latter-mentioned ingredient is known as a naturally-existing mineral, it postures a high concern for the reproductive, endocrine and developmental disruption. Or, in simple terms, sodium borate can possibly mess with human hormones. Cocamide dea on the other hand, is a chemically-improved coconut oil form used as a foaming agent for soaps. Everyone knows too, that soap usually contains fragrance, an undetermined content, and several other ingredients that are considered toxic in water. If you’re part of those in doubt about the homemade natural cleaning products, think again. You will never go wrong with dishwashing liquid soap you yourself, have made. 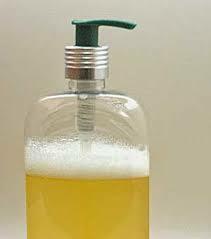 It is hassle-free, to make your own liquid soap. And the most important of all, you are guaranteed that what you’re about to use is safe because you know all the ingredients in it. Are you excited already? Before you start there are just a few things you need to remember about the type of water you’re using for this organic home remedy. To match the soap with the hardness, pH or softness of, it is best if you make small portions first before doubling or tripling your product. When you’re confident enough that you have the right water, you can start making your own liquid dishwashing soap in bigger quantities. Let’s get going with the eco-friendly awesome! About 20-40 drops of essential oil like lemon, orange and lime as these are ideal for cutting grease; (You can also use juniper and lavender as they are ideal choices too). See: Organic essential oils on Amazon. Boil the water over medium to high heat. Add the grated bar soap and stir continuously until the soap is dissolved. Once dissolved, remove the soap from heat and pour the mixture into a container. You may also pour the liquid directly into your squirt bottle or pump dispenser (provided it has a wide mouth to allow thorough stirring). Add the liquid castile soap, 2-1/4 teaspoons natural laundry soap and the glycerin and stir thoroughly and continuously. Leave it 24 hours, but once in a while, check the consistency by occasional stirring. Remember, the soap will thicken over time. For those who prefer the soap thicker, they can warm it up and have it dissolved in ¾ teaspoon natural laundry soap and let set once more. If a repeat process is needed, add about half a teaspoon every time until you achieve your desired thickness. Keep in mind that the soap has the tendency to thicken over time. If this happens, add a small amount of warm or hot water and stir to mix the ingredients. You can also shake the bottle from time to time. This ensures the thorough and even distribution of the liquid. If clumpy, process it in a blender or blend with an immersion blender. When you reach your desired consistency, add the essential oils and stir thoroughly. If you haven’t transferred it yet to the pump, do that now. See? Using all-natural cleaning products at home is safe and practical. Even the youngest member of the family can volunteer to wash the dishes as the dishwashing liquid is chemical-free. Remember, there is a baby soap bar content in this cleaning material so it’s safe to use by all ages. If you start making your own soap at home the natural way, you are sure to save money. Not only that! You get to initiate a healthy and clean lifestyle at home. This dishwashing liquid is just one of the many natural cleaning products you can make at home. And, you know what’s best about using homemade natural cleaning products is that you help save Mother Earth! Thanks for the tips, I appreciate it. I’ll use this on my next cleaning project and see how effective it is. Thanks! Love finding blogs like this, you learn neat little tricks that very few people know. Thanks for the advice!